When and where did democratic Marx, Lenin and Comrades rule the roost ? The narrative in the first person singular, deserves space, as much as any generic comment by one exalted or benighted, and ahem, I proudly would like to stake my own claim to belong to the latter brigade, call them proletariat, dispossessed, have-nots, what-have-you. And to the second part of the whammy, I was born in West Bengal, which till recently, for over three decades running, had the longest-serving, and, repeat, democratically-elected government anywhere in the world, yes, that includes wherever you, dear reader, may live, that emblazoned the very same symbol all across the state, and tried, for over three decades, to live up to the standards of Marxist dialectics, notwithstanding the joke that globally, the last statue standing of Comrade Vladimir Ilyich would be the one standing at Dalhousie Square. 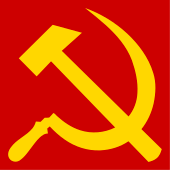 But would this dialectic and ubiquitous symbol move permanently into history ? That such constructive thought that wanted only the best, for the greatest good for the greatest number, as a political thought-process, has floundered, and meandered into oblivion, for ever, to get into the dustbin of has-beens ? I cogitate on this, and for me personally, the answer is an emphatic No. I had hardly ever been to my original native land of Kerala, except to suddenly find myself posted there on work for several months in 1998, and by sheer coincidence, witnessing the funeral of one of the doyens of the Movement that most Keralites swore by, EMS Namboodripad, who lived by example, that his and his colleagues’ extensive landed property should be available to the masses who cultivated the land. Several thousands filed by silently around the mortal remains of this man, who had, to use a phrase much-loved by the electronic media today, truly walked the talk. Then there was AK Gopalan, who mistook the “gold” necklaces flaunted on his own daughter’s neck on her wedding day, for the real thing, and actually thrashed her for this, till she could get her words in between her sobs, about the truth, that it was artificial make-believe “gold”. Which brings us again to the Manifesto – the sharing of resources, this time it was Water ( Teesta bore the brunt ) – for the greatest good of the greatest number. And now to my own narrative again…in the early 80s, I discovered to my pleasure that scarce had I had graduated from St. Xavier’s College, despite worrying about my academic performance, because I had spent more of my time reading Marx, Lenin, Trotsky and Bernard Shaw, and their ilk, in the library; escaping from the asides of giggling young nubiles as I marched past with a poker face, ” Oi dekho jachhey, bhabchey Amitabh Bachhan-er moton, dekhtey ” which roughly translates into ” there goes that ridiculous guy, thinks he looks like Amitabh Bachhan “. and even as I actually slept with a tome of Das Kapital by my bed, when it should probably have been ” The Wealth of Nations” of Adam Smith, to see me through without academic blemish; fortuitously, I got through. Yes, smile the Marxian smile, even laugh the Leninian Laugh, because the Rupee Symbol, soon to become a generic identity, seems not too far removed from the original idea: my country may yet well make Karl and Adam indulge in some effervescent hand-shaking and back-slapping camaraderie, if not on terra-firma, then right up there…..
There’s more to it in the interregnum. In the back streets of Calcutta in the early 80’s, that boasted of a history of gubernatorial diktat that spanned from Yangon ( even Singapore ) to Peshawar ( yes, even Kabul and Kandahar ), antecedents of today that still should recall the events at the turn of the previous century, and as Leftist thought flourished, even to the extent that it may well have kept an unwieldy subcontinent together, …where even such personages as George Habash, and Kamal Jumblatt, names that are all but forgotten even in their home countries, but got enormous print space in this left-oriented city, almost to the extent of the inanity with which the “Arab Spring” term is concocted and bandied-about today by the Western media, probably this very derisively-intoned Spring may never have occurred had the thoughts of those personages been lent adequate credence to, alas, I discovered that I was suddenly bereft completely, of friends and relatives who had, en masse, suddenly succumbed to the temptation of the embrace of Uncle Sam and the Big Apple, and may I be forgiven the feeling of more than just a wee bit of vulnerability that crept in my insides? And then the rub. After a stint with what is today part of Unilever’s, that took me to remote corners of my country on work, that I always clubbed with visits to so-called heritage or sites of historical interest, I applied for a job in the Gulf, Muscat to be precise, and was asked to join immediately with the Bahwan Group in Muscat, interviewed by the General Manager of the travel division, and asked to come over pronto. Which I did; and when I turned up there in the wee hours of the morning, accosting the personage who had selected me for the travel job, in his pajamas, he enquried of me blearily how I had reached there so fast, and that sorry, the Bahwans had assessed my worth, and found me suitable for a company in their group that was run primarily by the Lebanese management. At that ungodly morning hour ( Brahma Muhurtham, is what Brahmin Hindus may call it), with memories of my reading of Kamal Jumblatt and George Habash rushing in, I assented, even though the choices was probably limited, and more reason, my only intention of leaving home and hearth, was to make the proverbial quick buck, and get-rich-quick took precedence over any ingrained social equality that may have been aroused by reading texts that are increasingly, if not actually proscribed, no longer in favour.